So strange to think that we are 5 weeks into the school year, one week away from the end of the first marking period and thus almost 1/6 of the way through the year. After much anticipation, we gave our first unit test yesterday. The problems were all similar in structure to the problems from the group test on Wednesday, but with different patterns and different numbers. The hope is that students understand the structures and concepts, but still have to show what they know (rather than regurgitating the group test). Preliminary results look good. Most students wrote something for every problem (as opposed to many of our tests last year, which often had blank answers if students didn’t understand). As to the overall structure, I think we’re going to focus on the reflection day (which happens after the group test, but before the individual test) to see how feedback and conversation can help improve comprehension. Ideas include having groups of students explain problems to other students (a structure which has worked well before) and having students reflect on each problem. This student work is from the problem that I think students had the most trouble with. We gave them a problem with several mistakes, asked them to find the mistake and then draw the pattern correctly. (This structure was altered slightly from the group test and threw at least one class into a panic of “Wait, what do we do?”) This student saw the mistake with Figure 0 (which should have 2 squares instead of 4), but didn’t fix the (incorrect) equation. 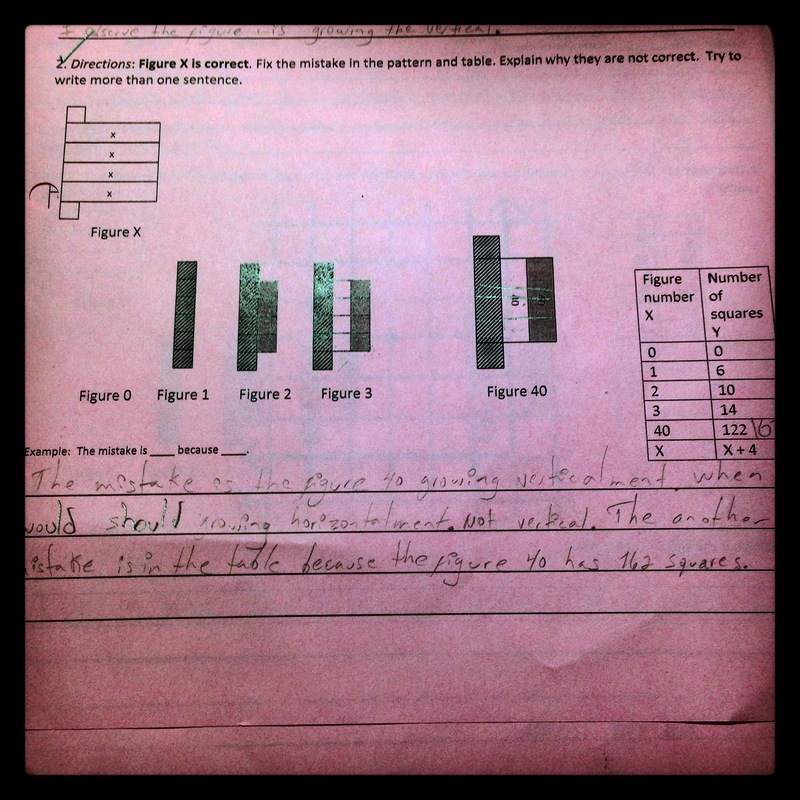 Because the test does involve some level of English and explanation, I tried to support students with less English. One student asked me how to spell “should”. Since the goal of this assessment is not correct grammar, I wrote it on their paper (in green, so that I would remember I helped them). Unfortunately, my penmanship is so atrocious, I think I only confused them more. Whenever we assess students summatively, I try to spread them out. 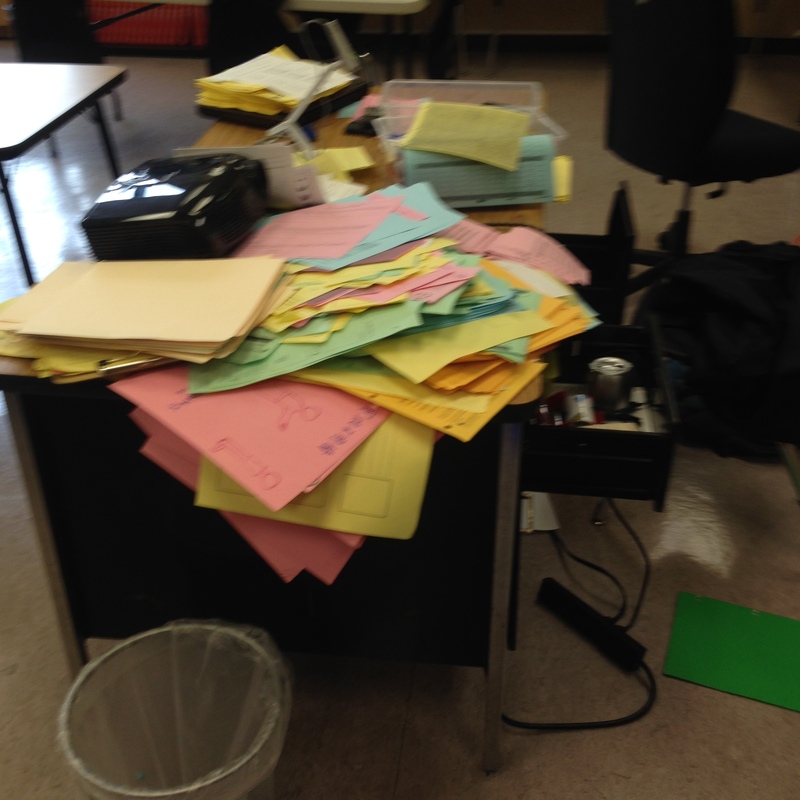 (We also make 2 versions of the test) As a result, I had to pick up all the papers lying around the room and put them in the one place where I couldn’t seat students: at my desk. Please don’t judge. Many students finished their test early. 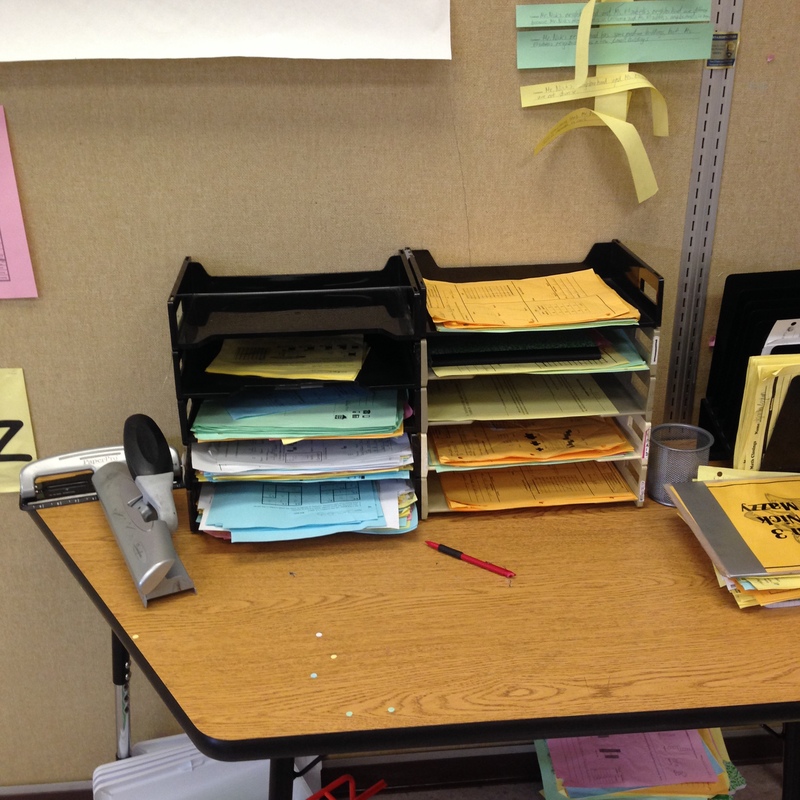 One student took it upon herself to clean and organize the area where I put finished papers. 1. Compare and contrast my desk (photo 3) with the student’s organization of my papers. 2. Can you spot all the mistakes in photo 3? 3. I’m happy to share copies of the assessment structure so far. I’d be curious to see how other people use group tests to prepare students for individual tests. Today was the first day we looked at linear equations as a class. Curriculum partner and I set it up as a station rotation where students looked at an equation and another representation (table, graph or figures) and then had to make additional representations. Didn’t get them quite as far as we wanted (trying to balance taking time at each station versus seeing a variety of equations), but we’ll be looking at linear equations in our third unit, so we have time. The kiddos had to figure out how many squares were in Figures 25 and 43. Some students still insist on adding the numbers until they get to the 25th or 43rd figure. In a (rare) fortunately-timed teacher move, I watched one student (who was largely absent last year but has turned it around this year) repeatedly add 2 to the number of squares in the 4th figure, aiming to get to the number of squares in the 30th figure. 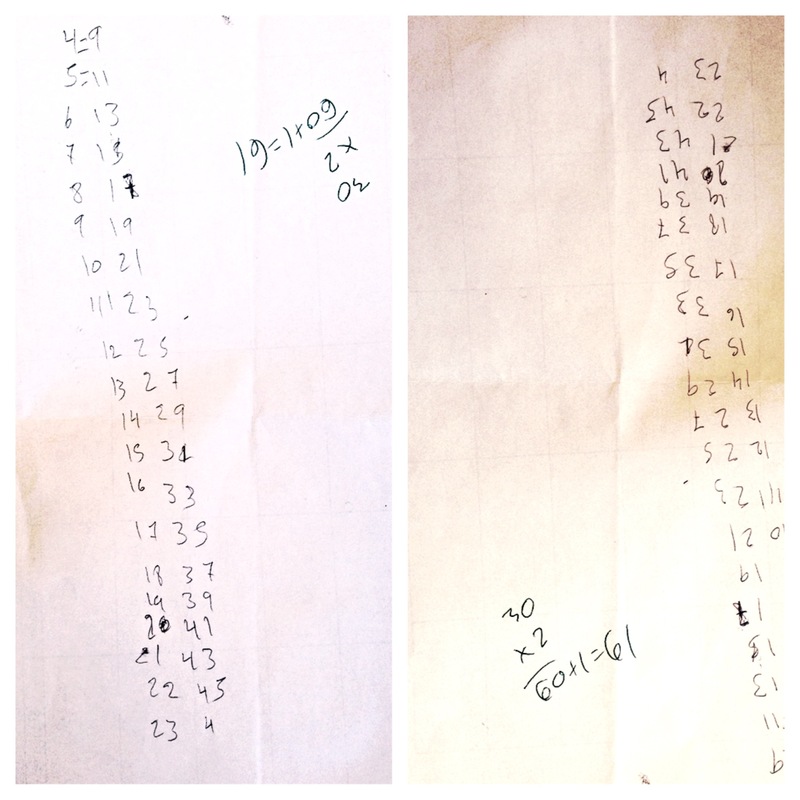 I waited until they got to the 20th calculation and then wrote the multiplication problem on the other side of the paper. 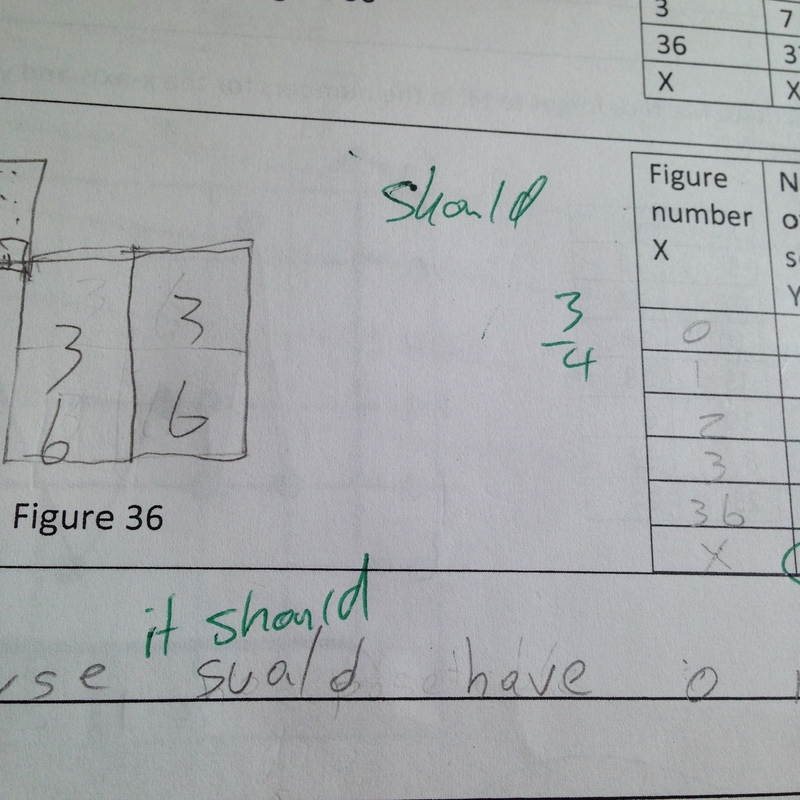 “Yeah, I guess we should have used multiplication,” they admitted once they saw the answer. Side note #1: Curriculum partner likes to talk about how lazy math teachers are. Multiplication is definitely easier than addition. Side note #2: we’re preparing for assessments for the end of our first unit: group quiz tomorrow (graded on participation with an eye to having students practice for the individual quiz), written reflection on Thursday and individual quiz on Friday. Any guesses as to the average student grade? As part of our unit project (graphing cost, revenue and profit for different number of items), we spent Thursday learning about cost, revenue and profit. This is much condensed from the last time this project was taught 2 years ago (when it spanned about 3 months). We learned about cost, revenue and profit through a reading guide. Teachers at our school write reading guides as scaffolded mini-articles where students read a passage together, then complete certain tasks after reading. This plays nicely into our focus on supporting reading this year. Usually, the tasks involve language functions like making predictions and inferences, but since our class is a math class, we usually do math tasks (calculate profit, calculate revenue, etc). Reading guides can be tricky. Students are supposed to read and stay with their groups. One of my classes is particularly antsy and there were students who were constantly getting up and asking friends at other tables how to solve problems. While I admire their commitment to finishing a task, one of my groupwork goals is for students to learn to work and talk with their group (rather than just their friends). Intervention #1: I taught groups that were often visited by wanderers how to say “We are working. Go (back) to your group.” (I was slightly flustered and forgot to add the word “back” when I wrote it on the board). I like this phrase. It emphasizes that the group is working. It emphasizes the behavior the wayward student should do. It isn’t quite as prickly as “go away” (which one of the kiddos constantly yells at other students. Sigh). It helps students who are doing the right thing actively redirect their peers in a more positive way. We’ll see if it works. Intervention #2: During the reading guide, I did a participation quiz, meaning that students earn points based on positive groupwork behaviors (reading in English, working together in the middle of the table, leaning in) and lose points if they leave their group or are not working. 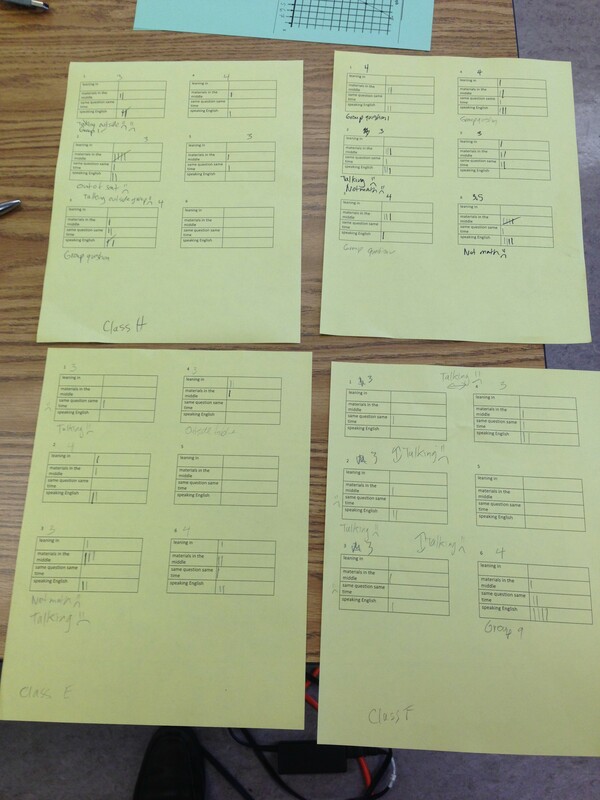 With 10 minutes to go (and realizing that many students were wandering), I showed groups the scores they were currently earning (and actually took points away from one group while they talked over me). I then crossed out the scores they were earning and told them they could raise their scores by following the positive group behaviors we had talked about earlier. To my surprise, students stayed in their seats for the rest of the period. Raise your hand if you’ve fallen off the blogging train. We’ve started a unit project that will actually span two units (linear relationships and slope). 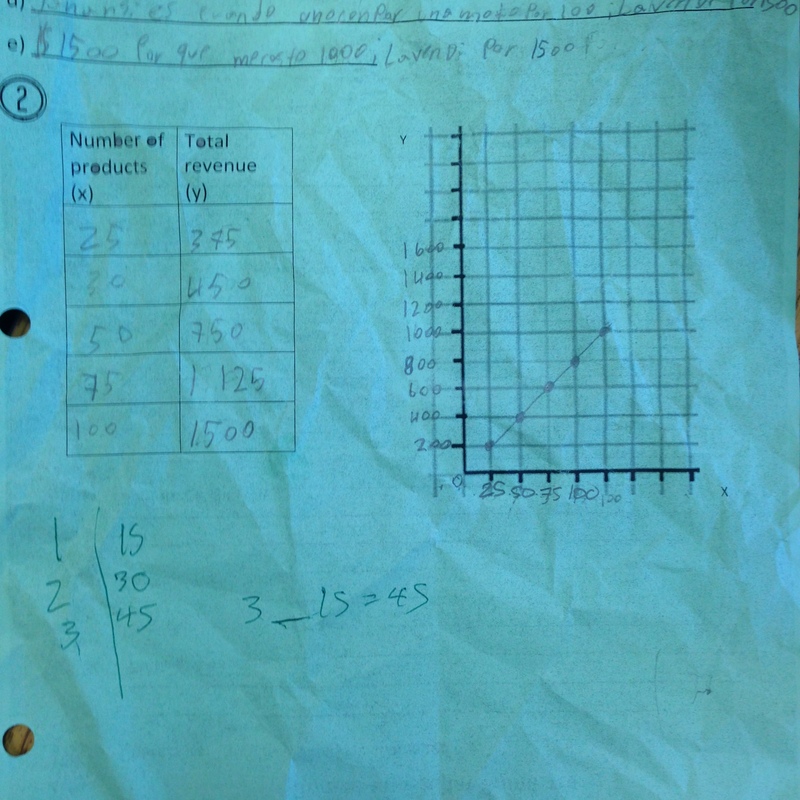 The idea is for students to design a product and then make graphs to help them set a price for their product. The plan is to actually sell the best product (as chosen by our classes). Overall objective: understand linear relationships. This means graphs for days. We need the practice. This photo is from a group of students that had a rough start when we changed seats this week. Different personalities, different school experiences, different math histories. Recently, they’ve been working together well (knock on wood). Some combo of helping a student who likes to work quickly see the benefits of working with the group rather than rushing ahead and helping students who tend to work more slowly see some of the things they can contribute (translating, explaining their calculations, explaining to group members who don’t understand the first time around). (I wish I were better at explicitly drawing attention to this in class. Next year?). At one point, one of the kiddos asked if their graph was correct. I said “no”. They crumpled it up and threw it on the table (mostly kidding, I think). We talked about the graph as a group and fixed it (kind of). If you look closely, you can see the results of the crumpling as well as an impromptu explanation of why we multiply the number of products by the price to get the revenue. Also, a somewhat incorrect graph. Because: what would we do tomorrow if today were perfect? The group later asked if another graph was correct, at which point the kiddo in question covered his ears and said “don’t tell me!” (we worked it out). I was tired at lunch today. Then there was some student drama (’cause high school) and I’m generally on the struggle bus by the end of the day anyway. So today was rough. I also forgot to bring Gatorade, didn’t have time to get coffee, and the vending machine refused to cooperate, so today’s afterschool meeting was also rough (Bless my coworkers and their infinite patience). Needless to say, not a bad day, but not a stellar example of me taking care of myself. As part of our effort to increase numeracy and participation, we’re continuing number talks. 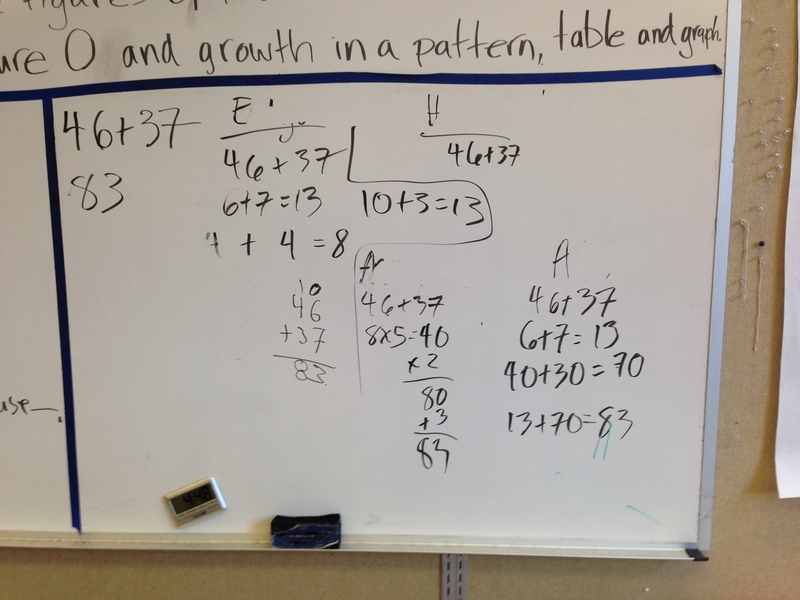 Today, we looked at 46 + 37, figuring that it was too hard to add mentally and didn’t have any neat shortcuts like adding nines (but we could build on some of the strategies we learned by adding nines last week). This class had a long discussion about the traditional algorithm (not in those words), which I think lost some students, but felt important to discuss. We talked about whether the 1 (from 6 + 7) is a 1 or a 10, though I didn’t frame it as well as I would have liked. I think the student who multiplied 8×5 just worked his way back from the answer, which, in retrospect, is pretty cool, though I wasn’t quite sure how to address/acknowledge it at the time. 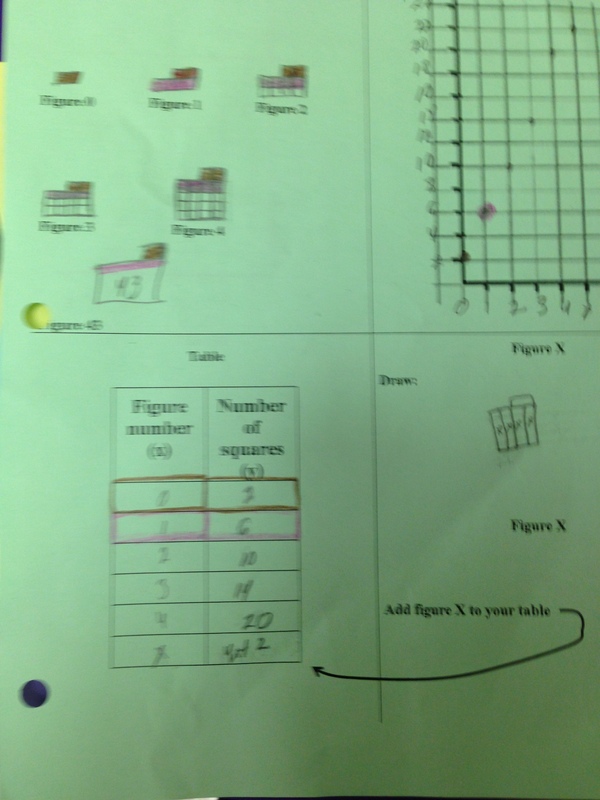 Students are exploring the relationship between pile patterns (figures built of blocks) to tables and graphs. Today felt a bit rushed and I worry that student work reflects this. 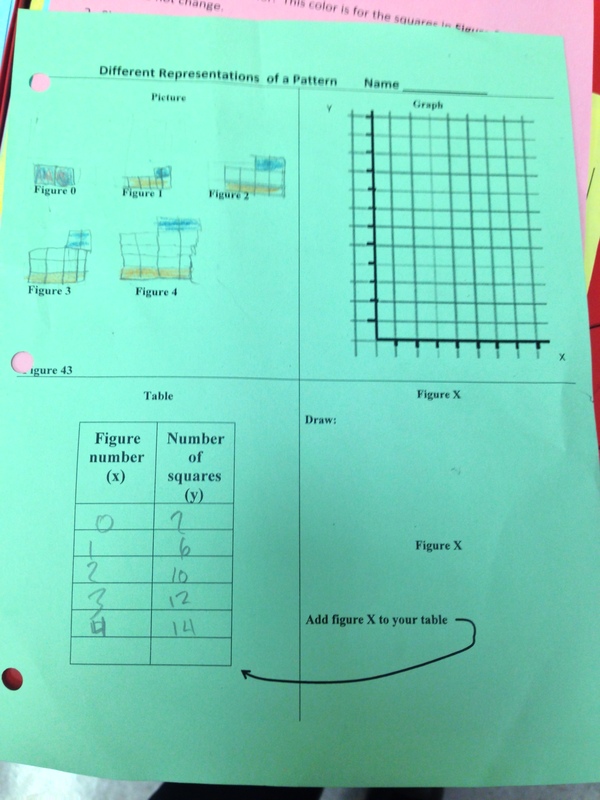 Students are pretty good at figuring out what the pattern of figures looks like and can fill in the table. We need a bit more practice with graphs (which we’ll do tomorrow). Photo #4 is the eponymous “incomplete graph” from one of my classes. 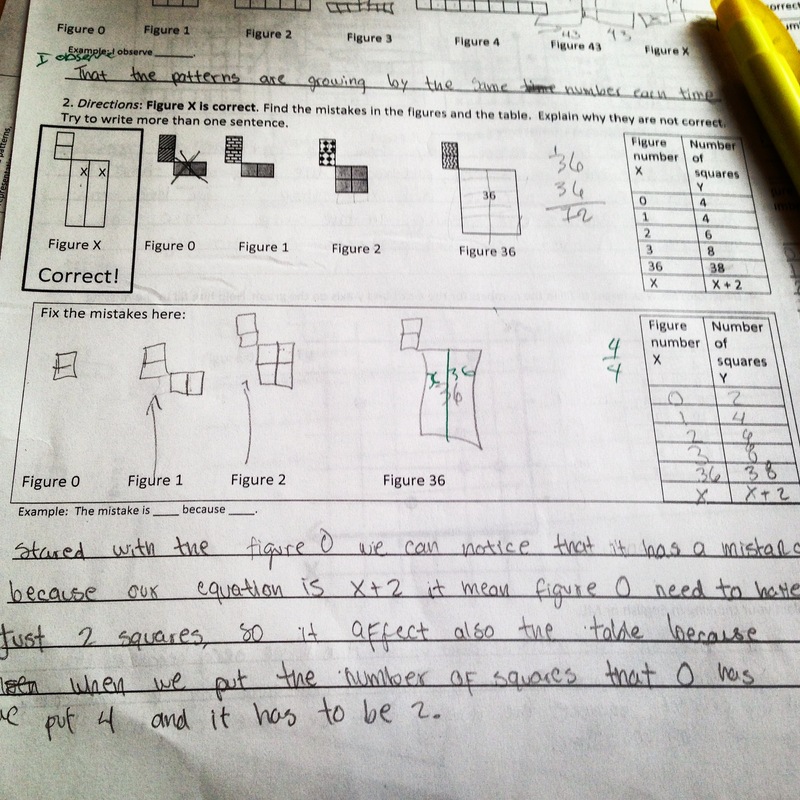 Another teacher was quick to point out that most students take time to get started and to build the pattern that they need to make the graph and table – not finishing everything is not (necessarily) the same as not understanding. Plus we’re spiraling in a lot of this tomorrow. It’s taking me a bit of time to get back into the swing of things, especially things that happen on the fly, like grading participation quizzes. This is the second participation quiz I’ve graded this year. I forgot to give the results to one class, but I think they’ll be OK. While participation quizzes are supposed to emphasize positive things, I remembered to take points off when students were talking outside of their tables (a norm that our team is trying hard to enforce). Debating whether or not to enter them into the grade book. I think I’m shooting for one participation quiz grade a week. – What’s a math problem that’s just challenging enough to be too hard to do mentally? – Is it wrong to document “bad things” on participation quizzes (with smiley faces)? – How cranky (on a scale of “1” to “Hulk”) do you think I am without coffee AND Gatorade?